Meteorological Summer (1st June thru 31st August) is now in its final few weeks. We have also already gotten through the average hottest day of the year (statistically it’s 23rd July) which means we are beginning our slow slide into Winter. Meanwhile, why is it so darn hot out? In this month’s Behind the Forecast, I’ll explore Maine’s week or two of hazy hot and humid weather and why we don’t often see temps this toasty. 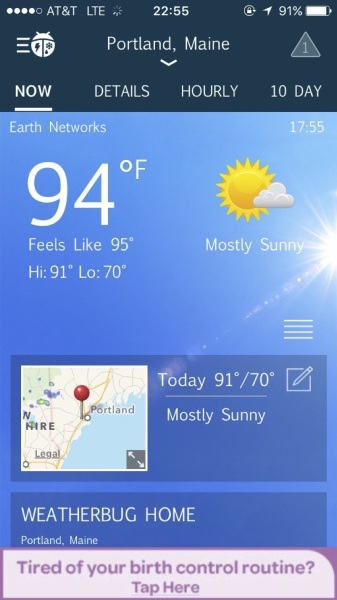 14th and 15th July brought two of the best examples of Maine’s two types of heat. When it feels really hot out, we either have reasonable temps and oppressive humidity, or very high temps and lower humidity. Thankfully, we rarely see the 90 and very humid other areas of the country see. If it’s going to be very humid (dew points >70), our temps will rarely exceed 80-85 in Portland. If we see highs in the 90’s, dew points will typically be much lower. 14th July saw very high dew points which made going outside feel like an extended trip to the sauna. Despite how oppressively hot it felt, the heat was much more due to dew points in the low to mid 70’s (Portland topped out at 72, Portsmouth saw a dew point of 75). Temps that day topped out at 77 which was recorded at 11 a.m. before southerly winds brought in cooler, but still very humid, air off the water. Who knew the mid 70’s could feel so hot? The 15th brought much warmer temps, but also much lower dewpoints. Temps soared up into the low 90’s (Portland topped out at 92) but dew points were much lower as the humid air was chased just offshore by overnight showers (dew points fell to 62 during the heat of the day). Did it feel hotter? Maybe, maybe not, but it certainly felt different. Both the 14th and 15th were unusual for Maine, even in the Summer. The average high temp in July is a comfy 79, August, on average, brings a high of 78. Why do we not see oppressive heat more often? The short answer, for Portland at least, is the ocean. The Gulf of Maine gets its water from the Labrador current which travels south around Nova Scotia from the icy Labrador Sea near Greenland. The warm Gulf Stream takes a hard right at Cape Hatteras and whatever is leftover is sent packing by Cape Cod, leaving the water temperature near us quite chilly all year round. The average water temperature in Portland peaks in August at a frosty 62 degrees. Simply the proximity to such cold water will dampen the effects of a warm airmass. A sea breeze (explained in my May column), often keeps temps in Portland at a steady 70-75, sometimes even lower. To have heat, the winds must be out of the SW so as to oppose the sea breeze and prevent it from developing enough to have any real impact. Another ingredient you need for heat in Portland along with a SW wind is the sun. Getting the sun to pop out with a strong SW wind is tricky because in Maine SW winds tend to come out ahead of cold fronts which bring showers and storms to the region. With a cold front approaching, often times the sun will become hidden behind the clouds which prevents strong, heat inducing sunlight from reaching the ground. All in all, we’re lucky in Portland not to have too much heat. The need for the sun, the wind, and the ocean influence to all be doing the right thing at the right time prevents us from getting any serious sustained heat, though, as my editor noted, there are some very noticable exceptions to this. 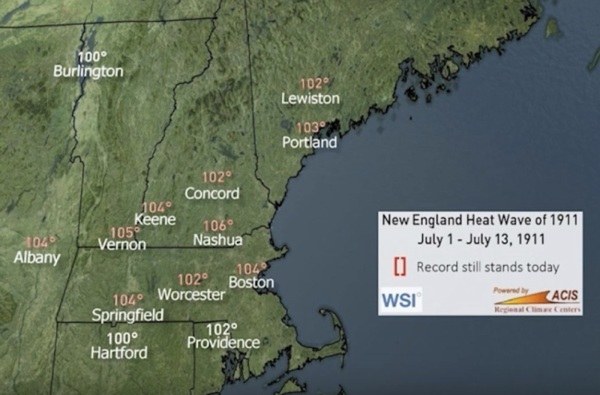 ​He did a bit of research and reports: The biggest exception was in July 1911, when what stands still today as the worst heatwave ever killed over 1,000 people in Maine and adjacent New England states. Many of the records established in that heatwave remain as the highest ever for the cities affected and for the states where they took place. To commemorate this event, the National Weather Service at Gray recently did a video explaining just what took place and how desperate folks got to escape the scorching 100-degree-plus heat in those pre-air conditioning days. The video can be seen as of this writing via a link from the Gray weather page at www.weather.gov/gyx/ or via a direct link at https://www.youtube.com/watch?v=DFfKB7QfP7s&feature=youtu.be. He says it’s worth a look and I agree. But what happens to make us hot when we are? When we do have heat, it comes in two forms: low humidity, high temps, or high humidity, low temps. Both feel equally uncomfortable, but neither is overly oppressive. We will likely see at least a few more days like the 14th and 15th of July, and later on the 22nd of July when we officially hit 95 degrees (which is when we took the photo at left) but as we breeze through August the days are getting shorter and temperatures will be responding to that soon enough. In a few months, we’ll be talking about nor’easters and the rain/snow line. Meteorology is also sometimes known as atmospheric science. It is an apt name because there is TONS of science involved in predicting the weather. As many of you know, science involves some big words and complicated terms that can seem confusing. To try to whittle away at the behemoth that is weather jargon, I’ll be explaining a couple terms I use frequently each month so you, too, can follow along with even the most technical discussions. If you have any more questions or have a term you want me to explain, shoot me an e-mail jack.sillin@gmail.com or send me a tweet @JackSillin. The heat index, also known as the THI (Temperature Humidity Index), or humidex, is a measure of how hot it feels outside. Think of it as the warm season equivalent of the wind chill, which measures how cold it feels out. It takes into account not only the temperature but the humidity. This means that a high temp/low dew point day would receive a similar Heat Index as a low temp/high dew point day. I tried putting in the temps and dew points from the 14th and 15th as a comparison but the calculations don’t work when the temp is below 80 degrees, as it was on the 14th. Just as an example, if temps on the 14th were a little higher, around 85, the heat index would’ve been 93, the exact same as the 15th with a high temp of 92. This shows how the heat index can serve as a common denominator so to speak for evaluating and comparing just how hot it feels on certain days. I use lots of geographic terms when discussing the weather as geography is very important when trying to explain what might be going to happen where and when. My definition of the ‘Immediate Coast’ for example is based more on which areas see the most influence from the ocean, rather than simply their proximity to salt water. 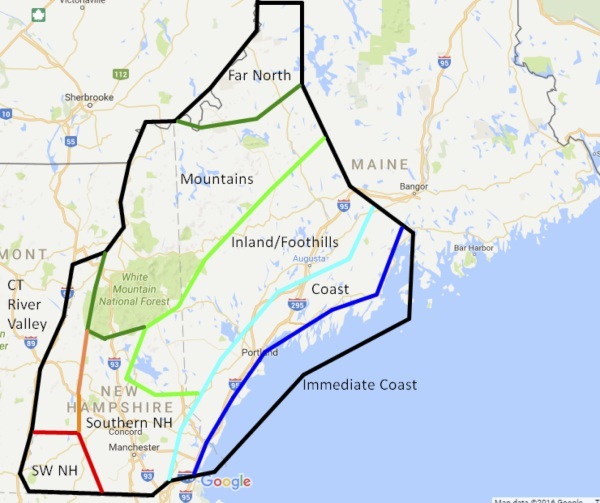 For example, I live in Yarmouth which is in the NW corner of Casco Bay. I, like many who live in Yarmouth, can see Casco Bay from my front yard. However, because I am nearly a dozen miles, and about as many islands, away from the open waters of the Gulf of Maine, it takes the sea breeze a little while longer to reach me in the Summer and likewise in the Winter. I have seen several rain/snow lines set up a mile or two to my Southeast, where most of the coast is seeing rain as I watch snow continue to pile up.